©2019 Bombardier Recreational Products Inc. (BRP). All rights reserved. ®, ™ and the BRP logo are trademarks of BRP or its affiliates. In the U.S.A., products are distributed by BRP US Inc. Offers valid in U.S.A. only from February 1, 2019 to April 30, 2019. The terms and conditions may vary depending on your state and these offers are subject to termination or change at any time without notice. See an authorized BRP dealer for details. Example: Tier A and B Customers: On a purchase where the Amount Financed is $19,599 your Down Payment is $3,200 with 84 monthly payments of $258.09 each. Interest Rate is 2.9% [ANNUAL PERCENTAGE RATE 2.9% (E)]. Note: The above financing programs are offered by Sheffield Financial, a Division of Branch Banking and Trust Company. Member FDIC. Subject to credit approval. Approval, and any rates and terms provided, are based on credit worthiness. Other financing offers are available. See your local dealer for details. Rates advertised are based on Tier A - B Customers with credit scores of 700 or higher. Minimum Amount Financed $10,000; Maximum Amount Financed $50,000. Other qualifications and restrictions may apply. Financing promotions void where prohibited. An origination fee of $0 will be added to the amount financed in the above example. 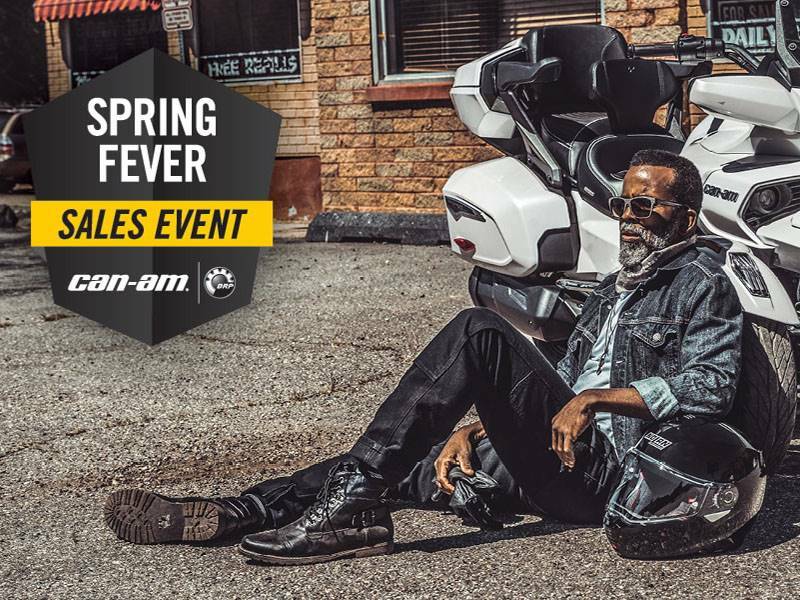 Offer effective on eligible and qualified 2018 Can-Am Spyder F3-S models from a participating Sheffield dealer. The $19,599 Amount Financed is estimated with qualified 2018 Can-Am Spyder F3-S models with a MSRP $22,799 minus $3,200 Down Payment. Amount Financed excludes taxes, title and license fees. Other fees may apply. See dealer for product eligibility and qualifications between 02/01/2019 and 04/30/2019. Offer subject to change without notice. [“E” means estimate.]" Some models depicted may include optional equipment. Follow all instructional and safety materials. Always observe applicable local laws and regulations. Always wear a helmet, eye protection and appropriate protective clothing. Always ride responsibly and safely. Always remember that riding and alcohol/drugs don’t mix. BRP, its agents and affiliates and participating dealers may contact me on any number I provide, whether a mobile phone number or a land line phone number, using automated telephone dialing systems, text and/or pre-recorded messages to expedite my request and present other related offers. By providing a telephone number and/or completing a quote form, I expressly consent to these methods of contact. I understand that calls and messages to any mobile phone number I provide may incur fees from my cellular provider. I understand that consent is not required as a condition of these services. Call us at 1-844-311-8834 to process this form without consenting to these notification procedures.